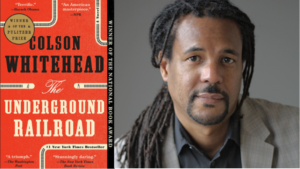 Three professors from the Oregon State University School of Writing, Literature, and Film will lead a three-part discussion of Colson Whitehead’s 2016 novel, The Underground Railroad. Colson Whitehead is the 2018 recipient of OSU’s Stone Award for Literary Achievement. In anticipation of his April 1st visit to Corvallis to receive the award, the library will host three hour-long discussions on his most recognized novel. The Underground Railroad is a winner of the Pulitzer Prize, the National Book Award, the Clarke Award for science fiction literature, as well as an Oprah’s Book Club pick! Thursday, February 21: Join Associate Professor Raymond Malewitz in a discussion of the first third of the novel. Dr. Malewitz teaches courses in contemporary American literature at Oregon State University. Thursday, February 28: Join Associate Professor Karen Holmberg in a discussion of the second third of the novel. Dr. Holmberg, author of two collections of poetry, teaches creative writing in Oregon State University’s undergraduate and MFA programs. Thursday, March 7: Join Professor Iyunolu Osagie in a discussion of the final third of the novel. Dr. Osagie teaches courses in African and African American fiction, poetry, and drama at Oregon State University and is the author of The Amistad Revolt: Memory, Slavery, and the Politics of Identity.